After school the first words to come out of most children's mouths are "What have you brought me to eat?". 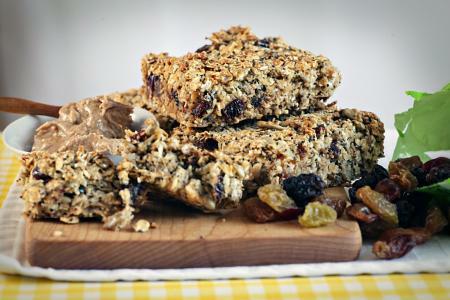 Sort out the hunger pangs, energy slumps and general moodiness with some healthy but delicious snacks as suggested by Kate Percy, author of Go Faster Food for Kids and mum of three. It's 3.30 pm. You rush to meet your beloved children at the school gate only to find they’ve metamorphosed into grumpy little horrors. Yes, it seems to happen to even the most delightful and mild-mannered! Generally just a short-term blip, the ‘magic’ production of a tasty snack from the handbag usually sorts them out; a booster to keep them going until tea-time, or to energise their after-school activity or club. Of course the odd pack of cheese & onion or jelly tots every now and then isn’t going to do much harm. Processed sugary and salty foods as ‘everyday treats’, however, encourage children to develop a strong taste for salt and sugar, which may not only lead to health problems in later life, but also provide only a short-lived energy boost, followed most likely by a slump in energy and, even worse, the onset of crotchetiness. Take the Ferrari scenario. Would you put diesel into a Ferrari? Every car needs fuel; indeed, the finest cars need the finest fuel. Likewise, the more nutritious foods you provide your child, the more sustained their energy and concentration will be. What’s more, you’ll see an improvement in their mood too! Most parents will have experienced the effects of the ‘sugar high’ on children after eating ice cream and sweets. Bananas provide slower-release carbohydrate to keep energy levels on a more even keel. Pre-wrapped in nature’s own packaging, sweet, easily digested and loaded with nutrients including potassium, vitamin C and B6, bananas are portable and cheap. What’s more, nutrients in bananas can protect against sleeplessness, mood swings and irritability. Better pack one for yourself too then! An excellent source of heart-healthy unsaturated fats, nuts and seeds help boost immunity levels, mood, brain power and brain development. An important nutrient for healthy growth and development as well as the manufacture of important hormones, children should be getting around 30% of their daily calories from fat. Encouraging children to get these from unsaturated rather than saturated fats will stand them in good stead for the future. If they don’t like eating individual nuts, try a small peanut or almond butter sandwich on wholemeal bread instead. Filling, sweet and tasty, dried apricots and mangoes are fabulous sources of the immune-boosting antioxidant, beta-carotene. Just a small handful will be enough for a sustaining snack as dried fruit, although a great alternative to sweets, contains much higher sugar content than regular fruit and is also high in fibre. Ditch the monster munch for this tasty, garlicky mush of chickpeas, olive oil and lemon juice, loaded with protein, good fats and sustaining carbs to promote healthy growth and development. Perfect for those children who prefer savoury to sweet. Buy a pot or whizz up your own hummus in minutes (the kids will enjoy making this too); it keeps for several days in the refrigerator. A few tablespoons in a resealable pot at pick-up time with some carrot sticks or a pitta bread will go down a treat at the school gate. 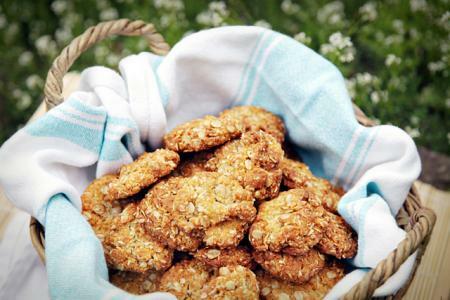 Tasy, nutritionally-balanced snacks don't have to be hard to prepare. These three options from Go Faster Food for Kids are the work of minutes, but will guarantee smiles at the school gates. An excellent choice for children going straight from school to a club, these filling bars are crammed with fruit, nuts, seeds and oats to provide a great balance of carbohydrate, protein and good fats, as well as important minerals and vitamins to sustain them until supper time. Make a batch at the weekend (it only takes 5 minutes; get the kids to join in!) and they’ll see you through the week. Preheat the oven to 140°C / gas mark 1. Grease and line an 18 x 25cm baking tray. Add the rest of the ingredients and spoon into the baking tray. Bake in the oven for 50 minutes to 1 hour, until golden brown. 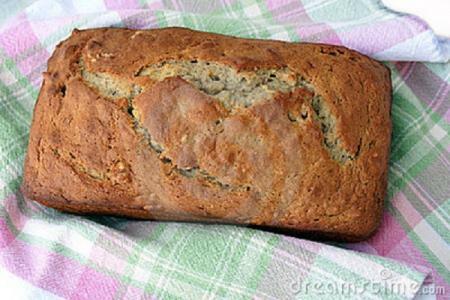 Packed with natural sugars, this deliciously moist and energising banana bread contains nutrient-rich carbs, protein, vitamin A, riboflavin, potassium and phosphorous. Malt extract has a long history as a health tonic and, in fact, was spooned into British children’s mouths during the Second World War as a magic elixir to ward of colds and winter illnesses. Preheat the oven to 180°C / gas mark 4 and lightly grease a 1 litre loaf tin. Put the flour into a bowl with the cinnamon, baking powder and salt. In another bowl, cream together the margarine, soft brown sugar and malt extract with an electric whisk, until pale and fluffy. Beat in the eggs with the whisk, one at a time. Stir in the buttermilk or yoghurt and the bananas. Fold in the flour mixture and then finally fold in the raisins. Pour the mixture into the tin and sprinkle with the Demerara and cinnamon mix. Bake for 35-40 minutes until golden brown and springy to the touch. Place the tin on a wire rack to cool. When cold, remove from the tin, slice and spread with unsalted butter. Preheat the oven to 160°C / gas mark 3 and lightly grease a large, flat baking tray. Gently melt the butter and the golden syrup in a pan. Dissolve the bicarbonate of soda in the boiling water and stir it into the melted butter and syrup mixture. Combine the other ingredients in a separate bowl and the pour into the pan. Stir to combine. Form walnut-sized balls of the mixture and place onto the baking tray, allowing room for them to spread. Bake in the oven for 15-20 minutes until light golden brown. Cool for a few minutes in the tin and then transfer to a wire rack to cool completely. They will crisp up as they cool. 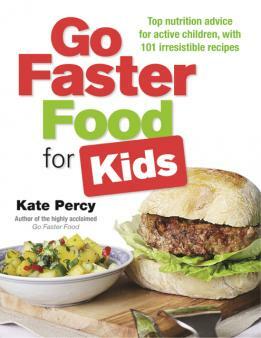 Kate Percy’s Go Faster Food for Kids (£16.99, Go Faster Foods) puts top nutrition advice for active children into practice with delicious, fuss-free recipes. The essential tool kit to unlock your child’s potential, the book is available from Amazon.co.uk and bookstores. TheSchoolRun readers can buy a copy of Go Faster Food for Kids at the discounted rate of £9.99 plus £2.50 p&p from the Go Faster bookshop.